3rd match of 2015 ICC Worldcup played today, South Africa played with Zimbabwe at Seddon Park, Hamilton. South Africa puting into bat first by Zimbabwe, put huge totals of 339 runs to achieved for Zimbabwe. Zimbabwe team all out scoring 277 runs and lost the match by 62 runs. DA Miller (South Africa) declared man of the match for his super fast inning of 138 runs of just 92 ball. Earlier, Zimbabwe won the toss and decided to field first. Putting into bat first, South Africa could not made batter start as expected. SA lost both openers on team score 21 runs in 4 overs. Next coming Faf du plessis and skipper AB de Villiers also departed early on team score 83 runs. But middled order batsmen DA Miller and JP Duminy took the charge in hand and played spelendid innings for South africa. Both go after Zimbabwe as well and played firing innings. DA Miller made 138* runs of just 92 balls with 9 sixes and 7 fours in just 92 balls. JP Duminy also played good inning of 115 runs fo just 100 balls. South Africa managed to put uge score of 339 runs to achieved for Zimbabwe. Following the target of 340 runs, Zimbabwe started inning with CJ Chibhabha and Sikandar Raza. Sikandar Raza could not get batter start and lost his wicket scoring just 5 runs. H Masakadza joined with CJ Chibhabha and played good inning of 80 runs and put Zimbabwe into game initially. BRM Taylor also played well and contributed 40 runs of 40 balls. other lower order batemen could not stood in middle for long and Zimbabwe all out in 48.2 overs scoring 277 runs and lost the match by 62 runs. 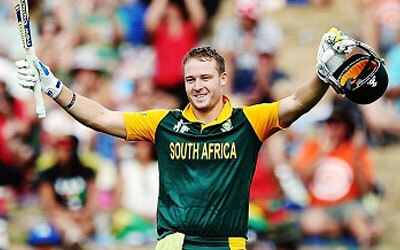 DA Miller (South Africa declared man of the match for his super fast inning of 138 runs of just 92 ball.